After flying home last night from Hamburg, it has taken me all day to get caught up on emails, business, bills, Lifeline mailings, etc. And now, whew, I can catch my breath and greet you all with a sunny first-golden-crocus-of-spring greeting. Yep, 2 of those beauties came up this morning in the garden. In Hamburg it was snowing yesterday and there were MOUNTAINS of plowed snow on every street corner and parking lot. The roads were icy and the wind was cold. So it is good to be back in the warmer region of the Rhine Valley. I had no idea what I would find when I got there for the rehearsals. I kind of like that risk of the unknown! What I found was a wonderfully prepared band and a well-rehearsed choir and lots of very happy and joyous people. And Henning Rauhut. Oh boy, did we have fun! Sabine Heilmann is an excellent choir director and we just clicked. The choir was so flexible and spontaneous in spite its' size. And the band around keyboarder Martin Decker, outdid themselves. On Monday I had a 4yourSoul concert at the Kammertheater in Karlsruhe. The concert has been sold out for about 2 months already, so there was no point in telling you about it beforehand! :) We invited a guest to perform with us. His name is Dino Soldo. www.dinosoldo.com What a musician! He has played all kinds of instruments for all kinds of great artists through the years. Saxophone, clarinet, harmonica, and electronic wind instrument played for Leonard Cohen, Ray Charles, Beyonce, Lionel Richie, Ernie Watts, Woody Allen, Lou Rawls and 4yourSoul. He just blew us away and inspired us to sing like we've never sung before. What an unforgettable concert that was. On Tuesday we flew to Hamburg and I spent the afternoon at my favorite bead atelier- Maddy Popper. www.maddypopper.de The owners of the store allowed me exclusive access to their treasure of beads from all over the world. And I went a little bit crazy there for about 3 hours. You will see the purchases from that afternoon popping up in Lifelines now for a while. On Wednesday we pre-recorded a talk show for Bibel TV. Florian, Eddie and I were interviewed by an interesting man, Wolfgang Severin, who is a Catholic priest in Brussels. Honestly, we could have visited with him for hours and hours. We had as many questions for him as he did for us. I don't know when it will be shown on television, but I'll try to keep you posted. So, what about Margot Käßman? Forget the fact that she was the first female Bishop of the Protestant Church in Germany. She is the mother of 4 daughters. I, as a mother, cannot imagine getting drunk, much less getting drunk and then getting behind the steering wheel of a car! Lord have mercy! She had to have drunk 1 liter of wine to have as much alcohol as she had in her blood. What a shame. 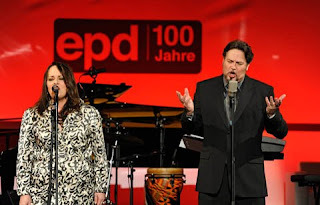 We met her 2 weeks ago when we sang in Berlin for the EPD 100-year celebration. She is so intelligent, sharp, clever, funny and wise. What in the world happened? Wishing you a Great Thaw! zwischen 18 und 18.45 Uhr in der Sendung Journal. - weltweit im Internet unter www.erf.de. Außerdem ist der Beitrag als MP3-Download im Internet verfügbar: http://www.erf.de/index.php?content_item=5342&node=1104. ERF - Der Sender für ein ganzes Leben. Sometimes, when I see the Holy Spirit working, I can only stand back and shake my head in awe and disbelief at how it works. I had a doctor's appointment today. (routine- nothing special) As I was walking out the door of my house I had the crazy idea of taking my doctor (who I've been going to for 25 years!!!) one of our new CDs, "Inner Sanctum". I don't know why I thought to do that because I've never done that before. When I was called into his office he seemed to be sort of tired and seemed somehow aged. But friendly as always. Before the examination began, I handed him the CD. He was pretty surprised and asked what it was. I told him it was a new duet CD of me and Eddie and I wanted to give it to him. He was so pleased and turned it over to read the song titles. His eyes kind of misted over and he thanked me kindly. After the exam, I noticed that his wife wasn't at the front desk as she usually is. I asked after her. He took me back into his office and told me with tears in his eyes that his wife has been recently diagnosed with cancer. She has had 2 rounds of chemotherapy so far. And many more to go. And she told him that the worst part of the chemotherapy was the sounds of the chemotherapy machines. So, yesterday her husband(my doctor) bought her a disc-man. And promised to find a CD that would soothe and comfort her during her next chemotherapy session. And then he looked me straight in the eye with tears rolling down his face and said that this CD would be absolutely perfectly suited to his wife's needs. And he said he was so moved by the fact that I thought to bring him this CD today. My eyes were wide with surprise at how stunningly sufficient God can provide for our needs. Often from unexpected sources. And I had the privilege of being a tool today to minister to my beloved doctor and his dear wife in a way I could not have imagined. Oh my, oh my, oh my, it was a tension-filled week last week. Eddie and I were asked to sing for the Queen of Germany. Oh, you didn't know Germany had a Queen? Well, it most definitely does! Queen Angie entered the Museum for Communication in Berlin last Wednesday with the pomp and pageantry befitting her royalty. The only difference being that Queen Angie prefers to wear business suits and doesn't wear a hat. She spoke at the Evangelische Presse Dienst 100 year Jubilee for about 20-25 minutes while Eddie and I danced backstage to keep our energy levels up while waiting for our entrance. Then, just as it sounded like Fr. Merkel was about to finish her speech, Eddie and Florian disappeared. And I started to panic. And I waited and waited, but they were gone. And I waited some more and finally sent someone to look for them. I started pacing and having mini heart attacks. They showed up calmly, not knowing that I was ripping my hair out. Eddie had gone back downstairs to the dressing room to sneak another look at the song text and Florian had gone downstairs to send a text message to someone. Good grief!!! A few moments later the Queen finished her speech and we expected her to be escorted straight out of the building. But she took her seat in the front row and stayed for us to sing! And then she left. We were pretty happy about that! During the evening the Bischöfin Käßman also spoke. And she reminded us that ancient texts like "The Lord's Prayer" are such a comfort to so many people in this day and time. Eddie and I can only agree with that. We are amazed at how many people have been touched by the old lyrics of the songs on our new album "Inner Sanctum". There is a great need to feel connected to the generations of the faithful in this turbulent time. So many things change so quickly. Communication is faster than we can process. What seems important today, can be trivial tomorrow. But some things have stood the test of time. After the tension and the long hours traveling to and from Berlin and nursing my son who developed a stomach virus, I was pretty rattled by the time Friday rolled around. And on Saturday I had such a treat to look forward to- a lovely lady named Sabine Schober invited me to immerse myself in a couple of pampering moments in her cosmetic salon. www.timeless-beauty-home.de Oh, the joy! After 2 1/2 hours of massaging, steaming, scrubbing and praising the Lord together, I left feeling very soft, very relaxed and very privileged. She's great!